Thanks to Norbert G. Mendes for providing the following information: To get to moD.AkAThI, get to petrApol in India and cross over to benApol in baaGglAdesha. A bus to barisAla is available: get off at shikArapura, and walk a couple of miles to get to the village. From Dhaka, the easiest way is to get to barisAla by air and take the bus, or take the bus to barisAla and get off at shikAra-pura, or take the launch to shikArapura. Even fifty years back (i.e. just before independence), the easiest way to go to this place from Calcutta involved taking a train to khulnA Station (22°50'33"N 89°33'30"E), which took the better part of a day, and then by an overnight steamer ride down the river to jhAlokAThI (22°38'30"N 90°12'17"E). 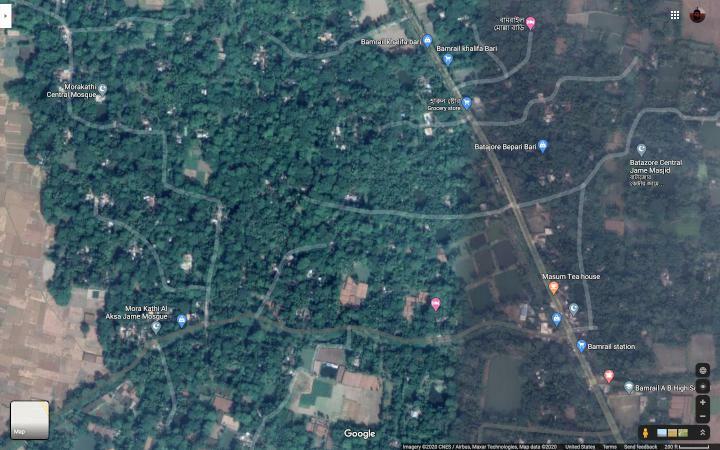 From there, one had to take a small boat to bAmarAila (marked on the sattelite picture: now the road goes where the stream was) through shikarpore(22°51'N 90°16'E; the port is marked in the sattelite picture above; the current road goes over the shikarpore bridge a bit to the southwest), again taking up the daylight hours, and thence to moD.AkAThI on foot. (The satellite picture is based on information from wikimapia.) The house was called shiromaNi bATi after guru-caraNa shiromaNi. 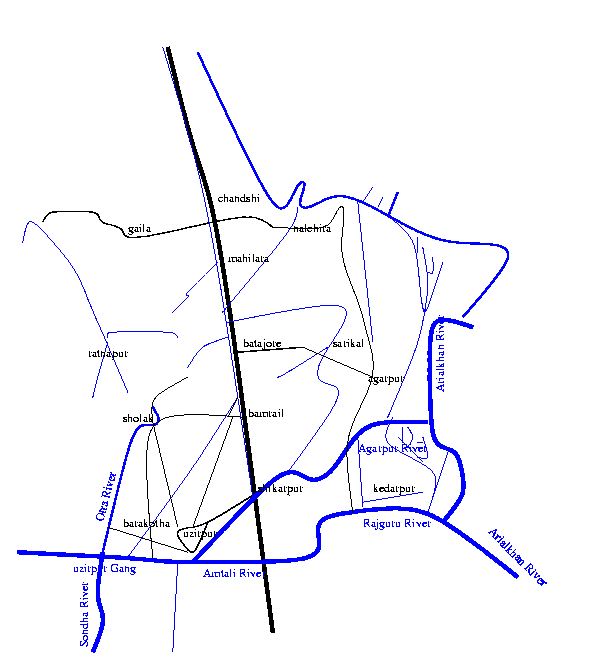 bATAjora and mailArA (mahilara) villages (now unions in gaurnadi upazila of wazirpur upazila) near it are more well known because of ashvini kumAra datta and surendra-nAtha sena, who were born at the two villages respectively. We had some land far away in bholA. My father does not remember a jamIdar in our village, definitely not a resident or a hindu one. There were a few other brahmin families in the village (one for example maintained the manasA bAD.i: see the main genealogy page as well). The muslims resident in the village were either in menial jobs or were farmers.